Apparently, revisiting Atari stuff in my XBOX One with the game Atari Flashback Classics Vol.1 made me write a review about this shmup. Most kids would cry if you told them to play with this. 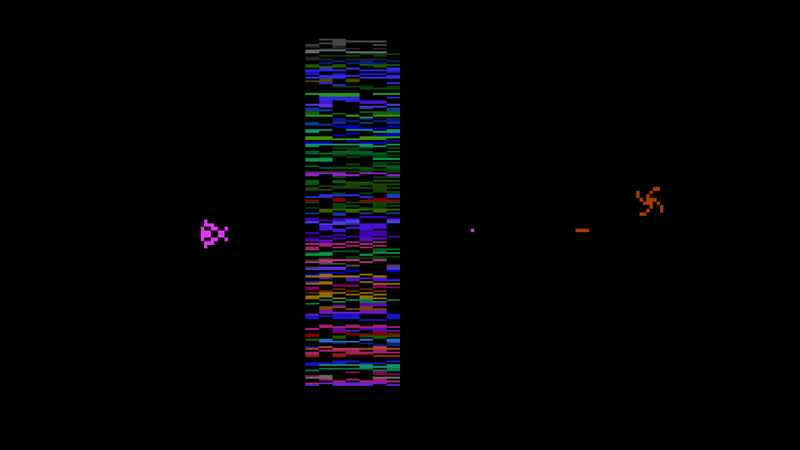 Yars' Revenge is the story about how insects from Earth got in a spaceship that crashed in another planet and evolved into super-intelligent beings known as the Yars. But being a new civilized lifeform has its challenges and its to battle an enemy known as the Qotile, however the Qotile are shielded and the only thing capable of destroy it is the Zorlon Cannon, the Yars' ultimate weapon. Your Yar has two main objectives: First one, take down the Qotile shields. The second is to aim and fire the Zorlon Cannon to destroy the Qotile. These objectives are the key of Yars' Revenge's gameplay. To take down the shields you can either "eat" them by nibbling the Yar on the Qotile's field, or simply shooting it. However, by eating a bit of the barrier you'll obtain a Zorlon Cannon shot which will do the same damage to the enemy's shield. But the most convenient strategy is to punch a hole through the shield until the Qotile is exposed. But it won't be easy, first off, the Qotile moves up and down, which will require some precision to fire the Zorlon Cannon, second the Qotile will turn into a deadly Swirl capable to take you down. To complete the enemy's offensive, there's a single bullet that tries to home into the player. This "Homing Bullet" will go slow-paced, but its speed increases as you progress in the game. You can also charge your Zorlon Cannon by touching the exposed Qotile once its exposed, but you've better stay out of its trajectory because the Zorlon Cannon can destroy you if you get hit. Fortunately, there is a "Shield" in this game and its the "Neutral Zone", a barrier located in the middle of the screen. When the Yar is inside the range of the Neutral Zone, the Qotile's homing bullet would not be able to inflict any damage, helping you to shake it off easier. However, a spinning Qotile will still be able to kill you inside the field. You can also take advantage by appearing on the top of the screen by going down to the bottom, that's a helpful trick to avoid the Swirls. The only proble in the Neutral Zone is that the Yar can't shoot its bullets. While the Qotile and the Swirl are apparently indestructible by your bullets, it can get hit and destroyed by your Zorlon Cannon as a Swirl, giving you the biggest bonus of the game: 6,000 points and an extra life, giving a bit of an extra challenge. No Cannon Bounce: The normal gameplay, if the Zorlon Cannon hits the Qotile shield, it will damage a part of it like a normal bullet. Cannon Bounce Activated: Similar to the normal gameplay, but this time if the Zorlon Cannon hits the Qotile shield, it will bounce back, increasing the potential of hitting the player. Ultimate Yars: In this mode, the only way to activate the Zorlon Cannon is by going to the far left side of the screen. Also, to make it appear, you will have to accumulate "Trons", which are like ammo to fire the cannon. For instance, eating part of the Qotile shield will give you 1 Tron, touching the Qotile will give you 2 Trons and catching a Zorlon Cannon after it bounces off the Qotile shield will give you 4 Trons. If a Yar bounces of the left side with less than five TRONS, it will not get a shot, but it won't lose the TRONS it has, either. (Each time a Yar is destroyed, it loses its TRONS). Each Yar has a capacity of 255 TRONS. If a Yar tries to take on more than that, it will short out and the Yar will lose all its TRONS. The count of TRONS is not displayed on the screen. Yar scouts understand the count instinctively. "Shoot the Core", years before Gradius came to existence. Graphically, the game had its points in favor, specially with the "Neutral Zone" which was like a garbled mixture of colors like a pixelated-and-colored static giving the illusion of being a force field of some sorts, along with the multicolored Zorlon Cannon shots giving the impression of being a high energy weapon. Also, the moving effect of the gaps in the squared enemy barrier was also an interesting detail. Despite the simplicity of the Atari 2600's graphics, your ship can be easily recognized as an insect-shape. The "explosion" effect of the destroyed Qotile is pretty impressive, like a massive energy blast of some sorts. Mindblowing for Atari's standards in my opinion. The sound effects are also a simplicity due to hardware's limitations, having a constant "Vrrrmm-vrrrrm!" in the background gives a fair impression of the sound of a large battleship nearby, while the Qotile explosion effect is perhaps the best sound effect of the whole game. - The game has an Easter egg. 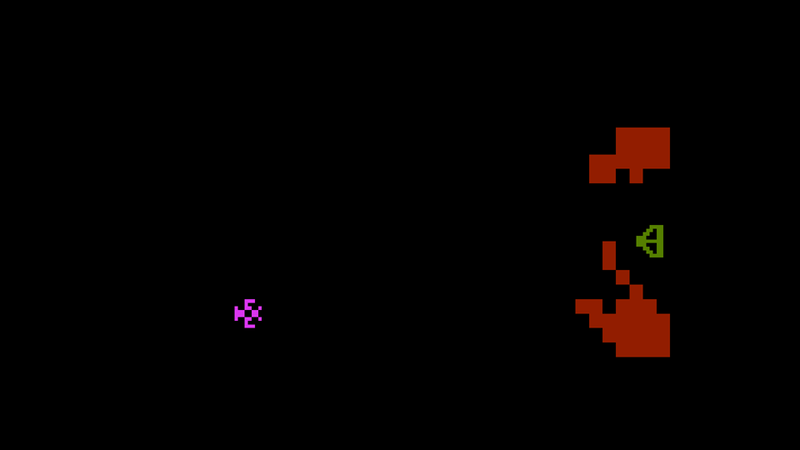 After killing the Swirl in mid-flight, a black vertical line will appear on the screen across the spot where the Swirl was shot (the line is referred to in the manual as the "Ghost of Yars" and warns the player to stay off its "mean streak"). If the Yar is in the lower 3rd of the screen and the black spot on its back across the vertical line at the moment the explosion vanishes, the game will end and go into the Game Select screen with programmer's initials, HSW, shown both forwards and backwards as HSWWSH in place of the player's score. - This forwards-backwards lettering is a clue to players to look at the names in the game manual the same way. Yars' Revenge might be a "fossil" of gaming for today's gamers, but its originality still deserves a few gaming sessions, however i think only retro-gamers would enjoy this game 'cos most nowadays kids would cry if you told them to play with this.